Leverkusen – At the VDI conference “Plastics in Automotive Engineering,” LANXESS will focus its presentation on the outstanding opportunities in car production offered by lightweight design with polyamide and PBT compounds. “Whether we are talking about electric, hybrid or gas-powered cars, or even low-consumption diesel vehicles, high-tech thermoplastic materials have become indispensable for all concepts of sustainable mobility. They are a lightweight alternative to metals and, in many cases, also to thermoset systems,” explained Dr. Martin Wanders, head of Global Applications Development in the High Performance Materials business unit of LANXESS. Another big topic at the LANXESS stand will be the acquisition of Bond-Laminates GmbH. Both companies – now under a single roof – are leaders in the applications development of thermoplastic composites e.g. in terms of their simulation, design, forming and process engineering. Customers benefit in particular from the fact that they can obtain composites, injection molding materials, and the associated composite technologies, including the respective know-how, from one source. ”At the VDI conference, we want to focus on the exceptional position we hold as a global supplier and development partner for high-tech lightweight solutions made of composites,” said Wanders. One of the highlights among the LANXESS exhibits is the prototype development of the housing for a passenger airbag module. It is made from the thermoplastic high-performance composite TEPEX from Bond-Laminates and a high-impact Durethan polyamide 6 copolymer. The safety component has very high dynamic load resistance and is over 30 percent lighter than a mass-produced, injection-molded version. “This illustrates the enormous weight-saving potential of hybrid systems with TEPEX and polyamide, also with plastic solutions,” said Wanders. At the VDI conference, Julian Haspel from LANXESS and Udo Gaumann from Takata AG will present a technical paper dealing with this interior component at 9 a.m. on March 14. It is entitled “Lightweight structures of overmolded nylon composite sheet in safety systems subjected to high dynamic loads”. Another exhibition highlight is an instrument panel support. It is produced from a new variant of plastic-metal hybrid technology developed by a partner company in cooperation with LANXESS. 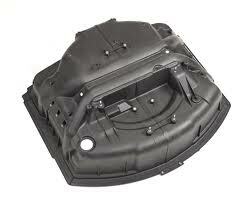 It combines a special metal forming process with the injection molding of polyamide. This component is just one example of the exciting opportunities offered by this new plastic-metal hybrid technology with regard, for instance, to weight saving and functional integration. The LANXESS stand will also feature two series-produced, modular structured bumpers for trucks from MAN. “They illustrate the enormous design freedom and advantages offered by thermoplastic materials such as PBT blends and polyamide compounds in terms of molding, coloring and economical process management compared with the sheet molding compound technology,” added Wanders.